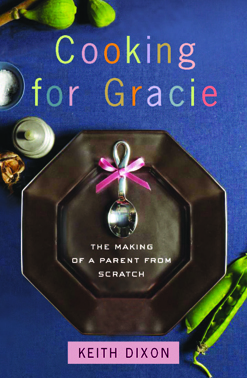 "COOKING FOR GRACIE works beautifully . . . a sweet tale that many parents will nod along to." A touching, insightful, and uplifting memoir, complete with more than forty recipes, that recounts a year in the life of a new parent learning to cook for three. Keith Dixon's hobby was cooking. When he had a rough day at work, he pulled himself through by dreaming about the complicated recipe he was going to attempt when he got home. All that changed when his daughter Gracie was born. There was no longer time to indulge this passion, and when there was, he had to learn to work around his newborn's schedule, as well as her dietary and developmental needs. Sleep deprivation, baby acid reflux, and--later--a very quick, crawling child were all ingredients he now needed to factor into his recipes. This book is the memoir of the first year of Gracie's life--as Keith learns what it means to be a good father and to still cling to what made him who he was before he had her.